President Donald Trump’s advisers are at pains to emphasize that Friday’s speech on Iran policy was an effort to lay out a comprehensive strategy to tackle the malign behavior of the Tehran regime, not just an announcement that the president had refused to certify Iran’s compliance with the 2015 nuclear deal. Their frustration that the headlines missed the forest for the trees is understandable — given the need for an Iran policy, not simply an Iran nuclear strategy, which was essentially the approach of the Barack Obama administration. But Trump’s advisers only have the president — and not the media — to blame. The Iran nuclear deal has long been the focal point of the president’s rhetoric and was the centerpiece of the speech. And the decertification of the deal was one of the few tangible actions outlined by the president. This focus on decertifying the Iran deal, reached between the US, five other major powers and Iran — is not just a distraction from the bigger picture: Iran’s destabilizing activities in the region. In fact, it also undermines US efforts to execute a strategy aimed at reducing Iran’s influence. While decertification brings with it an array of costs, it brings no obvious benefits. The main motivation for decertifying the deal seems to be the need to scratch a high-priority presidential itch. As the world knows, while the International Atomic Energy Agency and other entities have judged that Iran is complying with the nuclear deal, Trump is uncomfortable certifying it every 90 days, as required by Congress. His refusal to do so today must give the president a certain amount of satisfaction, given how unequal he perceives the terms of the deal to have been. And he has a point. But the decertification is not linked to the rest of a more comprehensive strategy in any way; none of the steps laid out in the speech require the president make such a determination before they can be taken. Instead, the failure to certify Iran’s compliance will make the stated objectives — to deter and prevent Iran from undertaking malign activities in the region from Syria to Iraq to Yemen –harder to achieve. Few people or governments will understand the difference between the president’s decision not to certify the deal from a complete US withdrawal of support for the deal. How many Americans — or others — know the difference between the Iran Nuclear Agreement Review Act and the Joint Comprehensive Plan of Action? The first is the U.S. domestic law that requires certification; the second is the international accord with Iran, and US participation in it is not related to certification in any direct manner. This complexity will help the president appear to be delivering on a campaign promise to “rip up” the pact. But it will also have the unfortunate downside of confusing allies, making it harder to work with them to bring additional pressure to bear on Iran outside of the deal. Moreover, it plays into Iranian propaganda and seems to reinforce Supreme Leader Ali Khamenei’s longstanding mantra that the US cannot be trusted and is really seeking regime change above all else. Moreover, Trump’s tough rhetoric obviously has repercussions within Iranian society. It undermines those in Iran who have been advocates of the deal — and strengthens its opponents. At the top of the list of those opponents is the Islamic Revolutionary Guard Corps — the group responsible for Iran’s efforts to destabilize the Middle East. Strengthening the very actor that you most want to debilitate seems to be a poor approach. Finally, if — as is very possible — the move not to decertify is answered by congressional crickets, Trump could find himself weakened, not strengthened. Surely, no president wants to declare his position that an agreement entered into by his government is flawed and against the US interests — only to see nothing happen. This will leave the president looking as if he is all talk and no action. 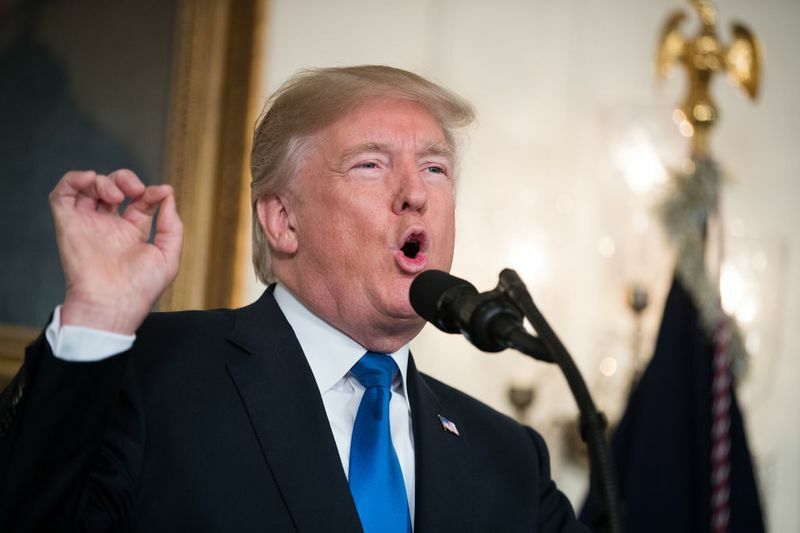 The starting point for Friday’s speech was correct: The US needs a more comprehensive strategy toward Iran, one that addresses its problematic behavior in the region. But a much better approach would have had very different components. First, it would not have made the nuclear deal the focus, but would have put it in the proper context: a transactional agreement about one particularly problematic behavior (the nuclear file), but not a transformational agreement that can only be viewed as failing in light of Iran’s continued misdeeds in other domains. Third, tangible measures to increase pressure on Iran to curb its meddling in other parts of the Middle East would have been the cornerstone of the strategy articulated Friday — rather than a sideshow. Such steps have been widely expected, and do not run afoul of the nuclear deal unless they replicate the sanctions that were lifted as its result of its signing. Steps to curb financing of terrorist groups and sanctions against the IRGC are fair game even while adhering to the pact. Notably, although complicated, a stronger approach might have involved some military measures; past experience tells us that the IRGC curbs its behavior when confronted more directly, as the US did in 2007 under the surge strategy in Iraq. Fourth, had the president been silent on certification, congressional efforts — such as those led by Senator Bob Corker — to lay out conditions under which lawmakers could impose new sanctions might have actually provided the Trump administration with some leverage. As has been true in other cases, from Libya to China, the administration could have found its efforts to gain greater cooperation from allies were enhanced by the perception that it is under great pressure from Congress to see tangible results. Instead, current congressional initiatives look a lot like what they are — efforts to stave off the most destructive behaviors of the administration — and are unlikely to help the president extract more cooperation from allies. Finally, a solid strategy toward Iran would of course need to address the country’s nuclear pursuits. But rather than focus on renegotiating the elements of the deal as it stands, a comprehensive US policy might have shifted gears to focus on what happens when elements of the deal start to expire. This is the only way to approach the very real question of what constraints will remain on Iran years later down the road.